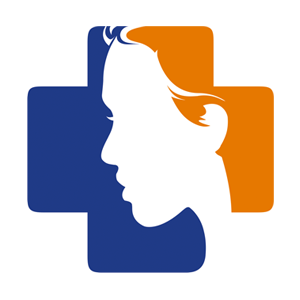 Khymeia will be present with its own stand at the European Congress of NeuroRehabilitation ECNR that will be held in Budapest, 9-12th October 2019. Here the link to the event. Khymeia will be present with its own stand at the 1st International Conference of TeleNeuroRehabilitation ICTNR, organized by Istituto S.Anna that will be held in Crotone, Italy, 10-11th May 2019. 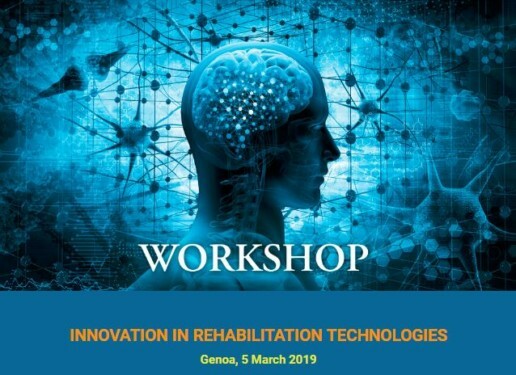 Khymeia will be present with its own stand at the Workshop "Innovation in Rehabilitation Technologies" that will be held at Policlinico San Martino Hospital in Genoa, Italy, 5th March 2019. Thanks to Irccs Stella Maris, Khymeia is present with the VRRS system at the Robotics Festival Pisa until October 3rd: for the first time the system enters the clinical practice with pediatric patients with a tele-rehabilitation project. 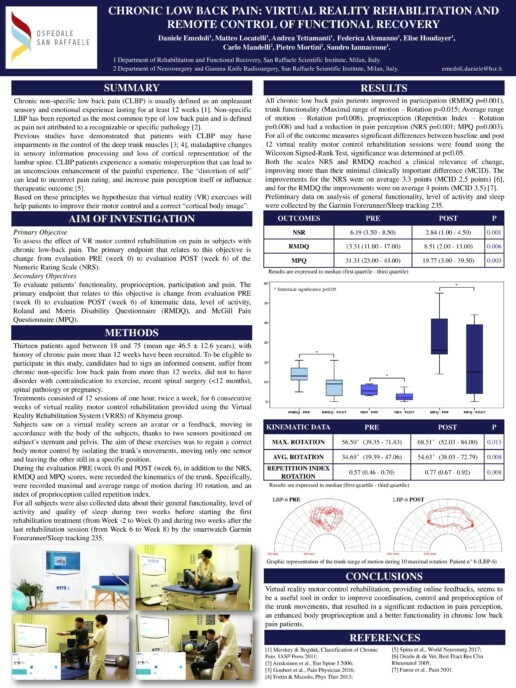 The XVIII National SIRN Congress, which took place in Trieste on 5th-7th April 2018, has been held recently; one of the main participants was the San Raffaele Hospital in Milan with a poster entitled "Chronic Low Back pain: Virtual Reality Rehabilitation and Remote control of functional recovery" presented by Dr. Daniele Emedoli. This study is about the use of the VRRS EVO system applied to the treatment of chronic low back pain, which highlights the effectiveness of our system in terms of improvement of coordination, control, and proprioception of trunk movements during the treatment; this results in a reduction of pain perception. Khymeia is present at XXVII SINEG National Congress, in Catania from 14th to 16th December 2017. Our Eng. Carlotta Varotto on 15th December at 16.30 will hold a training course for physiotherapists named "A new tool for post-stroke rehabilitation - VRRS System presentation". Here the link to the web site and the program of the congress. Professor Placido Bramanti, Scientific Director of IRCCS Bonino Pulejo, Messina, presents the VRRS immersive reality module on a live connection with RAI "Tutta Salute" TV show on date 29 th November 2017. At the 12° Congress ESPRM "Mediterranean Congres of the Physical & Rehabilitation Medicine", Malta 9th-12th November 2017, has been presented the preliminary results of the study "Virtual Reality Rehabilitation in Patients with Total Knee Replacement" by the team of Professor Marco Franceschini, from Neurorehabilitation Department, IRCCS San Raffaele Pisana, Rome. 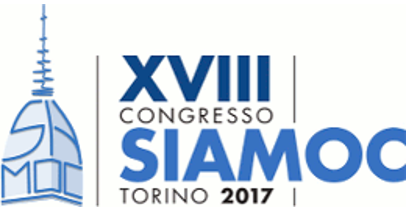 At the XVIII Congresso Siamoc, Turin October 2017, has been presented the preliminary results of the study "Virtual Reality Rehabilitation in Patients with Total Knee Replacement" by the team of Professor Marco Franceschini, from Neurorehabilitation Department, IRCCS San Raffaele Pisana, Rome. 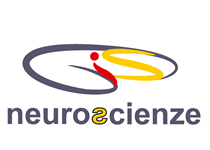 Khymeia is present with its own stand at the III National Congress GIS Neuroscienze and AIFI Veneto "Neurological Physiotherapy: Actuality and perspectives" that will be held in IRCCS Fondazione Ospedale San Camillo of Venezia, Dicember 16th 2017. Here the link to the website.